Special opening hours: from 9th till 13th March 11am – 7pm, from 14th till 18th March 2pm till 7pm. 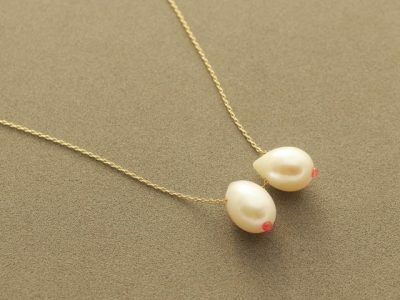 I basically believe that jewelry must be worn, but I am very interested in additional value of jewelry. You do not only to wear a jewelry, but you can also play with it. You may realize a hidden meaning of my piece in a casual way at the first glance. When you noticed the trick or hidden meaning, you can think of “that?” “I see!” or you may smile unexpectedly. 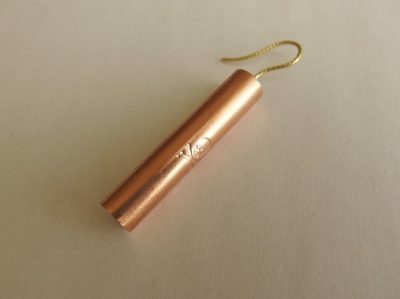 I aim to produce jewelry works in minimalistic style as communication tools, humor in which can connect people wearing my pieces and people who see my pieces. A series of works using physical tricks: necklaces which can change the color of the left and right chains, necklaces where the color of the ball changes at the entrance and exit, and necklaces/pierces/earring rings which move against gravity. A series of works with seemingly frustrating motifs such as bombs, dynamite, alcohol, tobacco, bees, drugs and human eyeballs or parts of women and men. Those motifs are reconstructed with wits in the works. 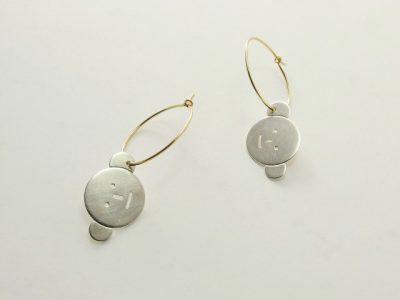 A series of tautology jewelry like a ring wearing a ring, an earring wearing an earring, a ring made of a ring …. These works, including new works and old works, will be exhibited together.